Residents pass by a security checkpoint with cameras in Xinjiang's Kashgar city, Nov. 5, 2017. Authorities in northwest China are testing facial-recognition systems that tip off police when residents of the Uyghur-dominated Xinjiang region venture more than 300 meters (1,000 feet) from designated “safe areas,” according to media reports. The safe areas comprise individuals’ homes and workplaces, Bloomberg News reported last week, citing a person familiar with the project, who spoke on condition of anonymity because they did not have authorization to discuss it with the media. State-run defense contractor China Electronics Technology Group is leading the Xinjiang alert project, which Bloomberg said is part of the Beijing-based company’s effort to develop software to collate data on jobs, hobbies, consumption habits, and other behavior of ordinary citizens to predict terrorist acts before they occur. The project, which began testing early last year, is focused on southern Xinjiang—home to the majority of the region’s more than 11 million Muslim ethnic Uyghurs. The alert project links security cameras to a database of individuals who have attracted the attention of authorities and tracks their movements within a particular area, Bloomberg’s source said, adding that police can then follow up by intercepting the individuals, visiting their homes, or questioning their families and friends. RFA’s Uyghur Service was not immediately able to confirm details of the new facial recognition program while attempting to contact relevant security officials. 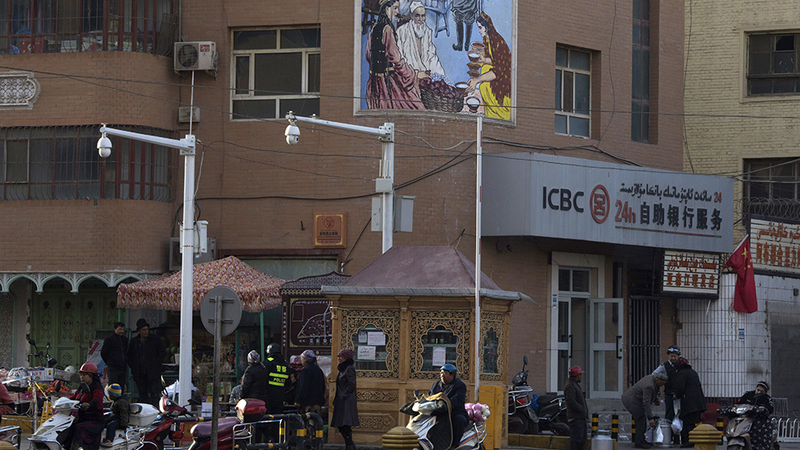 Sophie Richardson, China director for the New York-based Human Rights Watch (HRW), called the project “a whole new level in the use of surveillance technology to restrict people's behavior” and said it is important to watch how authorities in Xinjiang use the information they obtain through the project. “Obviously it is enormously problematic that police can be tracking people's movements without any clear indication of people having broken a law, but it's not exactly clear what the police will do with this information,” she told RFA. Bloomberg cited IHS Markit senior principal analyst Jon Cropley as saying that China is on track to represent 46 percent of the U.S. $17.3 billion global video surveillance market by year end, and three-quarters of all deep learning-enabled servers for analyzing the data. China earmarked 938 billion yuan (U.S. $146 billion) for domestic security in 2015—more than its military budget at the time—the media group reported, citing the last figures made publicly available. Xinjiang—where Uyghurs complain of pervasive discrimination, religious repression, and cultural suppression under Chinese rule—has become one of the world’s most heavily policed places and a testing ground for increasingly restrictive policies since Chen Quanguo was appointed the region’s party chief in August 2016. RFA has previously reported on authorities collecting DNA samples and other biometric data from all residents aged 12-65 of the region under the pretext of a free health care program. Other reports detail authorities rewarding residents who report “acts of terrorism,” ordering residents to hand in all digital devices as part of an operation targeting “terrorist videos,” installing GPS tracking systems on vehicles, and even affixing identification codes to knives belonging to Uyghurs so that they can be traced back to the owner if used to commit an act of violence. Since April 2017, Uyghurs accused of harboring “extremist” and “politically incorrect” views have been jailed or detained in re-education camps throughout Xinjiang, and last week a security official told RFA that around 120,000 members of the ethnic group are currently being held in political re-education camps in the region’s Kashgar (in Chinese, Kashi) prefecture alone. Ilshat Hasan, president of the U.S.-based Uyghur American Association exile group, told RFA that China had “completely transformed [Xinjiang] into a high-tech police state, the likes of which the world has never seen” since Chen was tasked with overseeing the region. “This is an unprecedented new phenomenon and is happening right under the nose of the international community,” he said. Under the Chen regime, Hasan said, Uyghurs must “watch everything they say and do, and even think,” and lack basic human rights, freedoms, security and privacy. “China hasn’t created this total police state to fight so-called terrorism,” he said. Reported by Adile Ablet and Alim Seytoff for RFA’s Uyghur Service. Translated by RFA’s Uyghur Service. Written in English by Joshua Lipes. Is Sophie Richardson working on any project to help the red natives get their land back? Another day in great terror state of china, where if you are Tibetean or East turkestani, you have less rights than dogs ! People should tell the great terror state of china that the 1984 book is not manual on how to establish civil society ! "Sophie Richardson, China director for the New York-based Human Rights Watch (HRW), called the project “a whole new level in the use of surveillance technology to restrict people's behavior” and said it is important to watch how authorities in Xinjiang use the information they obtain through the project." Any law-abiding citizen would welcome 24 hours police protection. Only terrorists and their sympathisers like Sophie Richardson feel restricted by CCTV surveillance. Sophie Richardson is a thoroughly humane person working tirelessly to defend the rights of the oppressed everywhere, regardless of their country of origin or place of residence. The vast majority of Uighurs in detention in Xinjiang are completely law-abiding and have committed no offence meriting incarceration. What we are dealing with here is not police protection, but police intimidation, racial and religious discrimination, and ultimately ethnic cleansing. You for your part are indignant simply because you do not have the humanity to identify with any other group than the one you belong to by birth, which just happens to be the group responsible for the 24-hours-a-day ethnic cleansing going on in Xinjiang.